My timing chain failed around 102k miles and I am having to bypass my radiator to keep my transmission cool to prevent the possibility of the radiator failing or leaking coolant into the transmission essentially destroying it. Both of this issues were well known by Nissan prior to when I bought this truck, and of course could have both been fixed under warranty, but they sweep it under the rug hoping that the warranty lapses thereby passing the cost of repair onto the owner. Even when there are viable workarounds to rememdy the issue, they are not recommended by Nissan which turned my glowing review of them into never owning another based off of this and the sad reliability with my 2015 Nissan Altima. 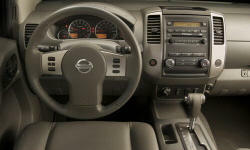 Why the 2009 Nissan Frontier? The V6 moves the Frontier along with plenty of power left to spare. Engine has a lot of torque. I decided to go with this truck over the Tacoma because the engine felt familiar to the my old G35 that I used to own. The truck holds it's value well. Even with body damage it still has almost as much value as my 2015 Nissan Altima. If you're going to but new, make sure it's a truck because they hold their value well. I like the way this truck looks. I have the bright red truck and when it's clean it's a very nice looking stylish truck. For a truck this thing has a lot of good functional storage on the interior, and enough cup holders for a family of 8! Got a pretty good deal at 21k with the Nissan power/feature package which gave the basic SE model some of the feature of the LE trim and the King Cab. 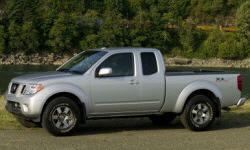 Why Not the 2009 Nissan Frontier? I used to love this truck then I encountered the faulty timing chain tensioner issue where my engine started to have this whine when idle and a rough start. The timing chair was loose and rubbing up against the guides causing the whine, and it costs $1800 to get everything replaced. Timing chains shouldn't fail that's why they replaced timing belts, but this one fails because of a cheap part used to maintain tension in the line which will fail sometime after 90k. Issue #2 is the shoddy radiators that can leak coolant into the tranmission fluid destroying the transmission. Nissan's recommeded fix is the replace the radiator which will eventually fail again instead of the fix I have found on the internet which is to bypass the radiator all together and buy a transmission cooler. It's probably better to be safe and sorry and do this repair or run the risk of your radiator destroying your transmission and a costly repair to replace both at the same time! I have seen school buses that will outturn the Frontier. I have drive a F-150 and it out turns this by a longshot. Be careful when making U-Turns, turning onto roadways, or parking into tight spaces with this truck. It takes a daft touch to keep it from running off the road or crossing into other lands. The tires that come with the truck destroy and quality of ride, so if you plan on doing nothing but pavement driving I highly recommend the highest tier Michelin tires. It improved the ride quality dramatically. Well worth the money. This will be a great used truck provided the the timing chain and radiator issues have been addressed at no expense to you. If so then buy the truck, just know it turns like a school bus, but it performs pretty well and looks good doing it. Better yet just buy a Tacoma, or spend a little more and get a F-150 or Silverado, or maybe even a Colorado. Nissan has gone by the wayside I can't in food faith recommend one. Do you research on Frontier/Pathfinder you'll see that the North Carolina Consumer board says to stay away from this vehicle.